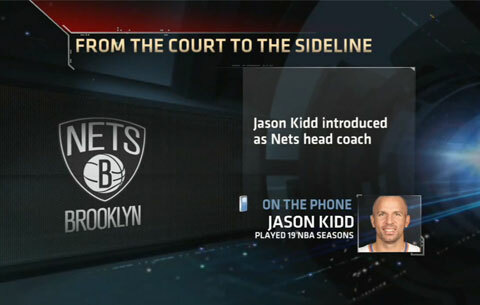 Nets general manager Billy King said Kidd is exactly what the team was hoping to get when hiring a head coach. Kidd was a ten-time NBA All-Star, a five-time All-NBA First Team member, and a nine-time NBA All-Defensive Team member. Kidd played college basketball for the California Golden Bears and was drafted second overall by the Dallas Mavericks in the first round of the 1994 NBA Draft. He was named co-NBA Rookie of the Year in his first season with the Mavericks. Then, from 1996 to 2001, Kidd played for the Phoenix Suns and later for the New Jersey Nets from 2001 to 2008. He led the Nets to two consecutive NBA Finals appearances in 2002 and 2003. In the middle of the 2007–08 season, Kidd was traded back to Dallas, where he won an NBA championship in 2011. After finishing his playing career with the New York Knicks in 2012–13, he retired and returned a week later as head coach for the Nets, who had moved from New Jersey to Brooklyn. If you would like to book basketball speakers, NBA stars or coaches like Jason Kidd for a speaking engagement, autograph signing, guest appearance, product endorsement, celebrity golf tournament, marketing or PR campaign, charity fundraiser or special event, you can request Jason Kidd agent and speaker information at PFP Sports & Celebrity Talent Agency. For booking Jason Kidd and for appearance fees, call 1.800.966.1380.